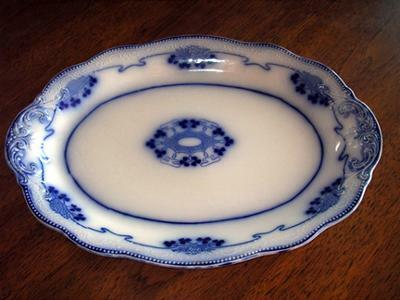 Q. I have a Flow Blue Platter that has a Mortlocks mark on it. The Pattern seems to be LORNE and is noted right above the mark. Yes, the mark also has GRINDLEY written in the bottom banner below the globe on he mark. Can you please tell me what this all means? J. MORTLOCK or MORTLOCKS was a Fine Retailers outfit in London, that carried lines from several manufacturers and of all sorts of items including Fine China Collectibles. It was like Harrods is today in London or Nordstrom or Tiffany's in the US. The actual maker is usually noted on this stamp, usually on the lower Banner below the Globe symbol. MORTLOCKS had practically all of the items they sold be marked the same way and most of their items were made to order, hence their stamp on this piece. Although the original company at times had the right to make this item and sell it outside Mortlocks, some designs were exclusive. MORTLOCKS PORCELAIN MARKINGS: Thanks again to John from marks4antiques.com for once again a fascinating pottery marks contribution which I am sure many of the visitors will find useful in their antique china hunting escapades. I am ashamed to say, although I am English and know Harrods as a store very well (used to work there for a time) I had never heard of A. J. MORTLOCK of London, let alone their policy on china marks. I also used to work for other London store Liberties of London (patron for so many years of the great Moorcroft Pottery). So a bunch of antiques experts in California know more than me about my home patch!